SEOUL, Oct. 28 (Yonhap) -- The Koreas and the U.S.-led U.N. Command have finished their two-day work to verify the disarmament of the Joint Security Area (JSA) in the Demilitarized Zone, a Seoul official said Sunday. They conducted the joint verification work Friday and Saturday following the Koreas' 20-day land mine clearance operations and then the withdrawal of military posts, armed troops and other weapons. "As a result of the three-way verification work, there wasn't anything particular (that needs to be addressed)," the official said on condition of anonymity. 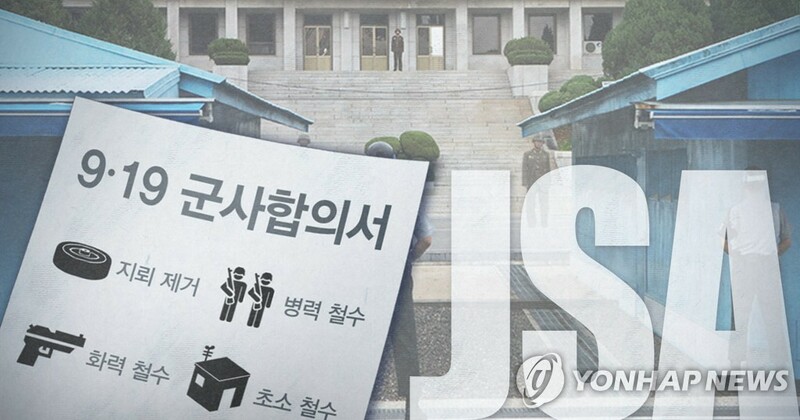 The Koreas decided to disarm the JSA under the military agreement their countries' defense chiefs signed during the third summit between President Moon Jae-in and the North's leader Kim Jong-un in Pyongyang last month. The UNC oversees activities inside the DMZ. The JSA disarmament is a key part of the agreement aimed at reducing tensions and preventing accidental clashes. In line with the agreement, the North removed five military posts inside the JSA, while four South Korean posts were removed. During the JSA demining operations, the North is said to have disposed of five land mines, while the South has discovered none. After the verification work, the two Koreas and the UNC will carry out a set of procedures to open new military posts for the management of the disarmed JSA and install additional surveillance equipment.